New Castle, NH is a town located on a large island and a number of much smaller ones, lining the entrance to the harbor at Portsmouth. Fort Constitution has been there since Colonial times, protecting the harbor and its Naval facilities. Originally it was a British installation named Fort William and Mary. It was the scene of what could have been the true start of the American Revolution, as Paul Revere rode up there from Boston four months before the famous battle of Lexington and Concord to warn the locals that the British were on the way to reinforce the fort. A battle ensued, and the locals stormed the fort and captured 5 tons of gunpowder and a number of cannons. The battle was a good start to the career of Lieutenant John Sullivan, who had advanced to Major General by the end of the war and later became Governor of New Hampshire. 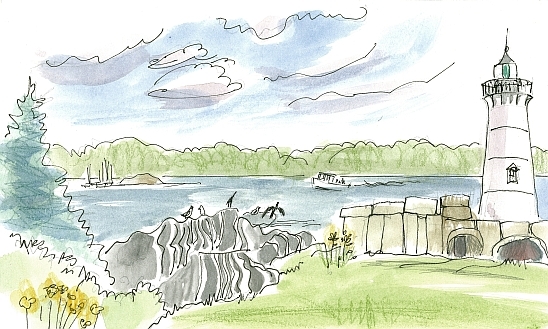 I drew the light house at the entrance to the Piscataqua River and the Portsmouth harbor. On the right sit the remains of the impressive granite fortifications of the fort, precisely fitted and still standing today. On the black and white rock formation the cormorants and sea gulls are preening, drying their wings, and contemplating their next meals. The lobster boat is heading back to shore with its catch. Across the river is the state of Maine. Just south of New Castle is the town of Rye. 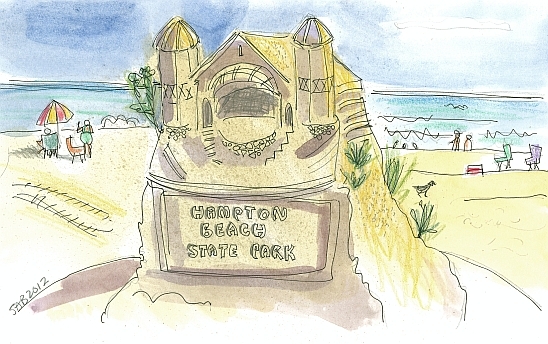 I drew the little path that gives public access to the beach. The Isles of Shoals are on the horizon, six miles away. 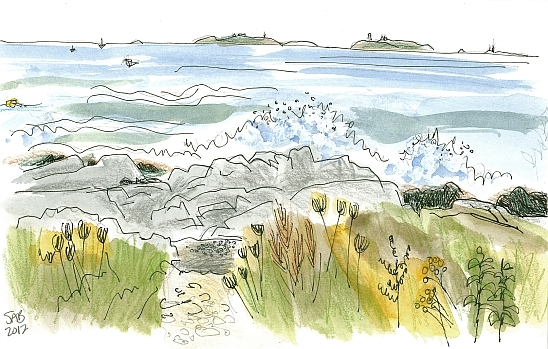 About a hundred years ago, an artists’ colony thrived on Appledore Island, with poets, painters, and writers on site. Now Cornell University and the University of New Hampshire run the Shoals Marine Laboratory on the island. The tide is coming in and splashing on the granite shore. Lobster boats crisscross on the water. A float bobs on the waves at the left, marking the spot of a lobster trap on the ocean floor. The seaweed and kelp covering the darkest rocks add to that good briny ocean smell. This view, looking north, is North Hampton, NH, just south of Rye. I had been on this road many times before, but never stopped. It was so good to get out of the car and take a walk along the beach. We walked up the hill and around the curve. 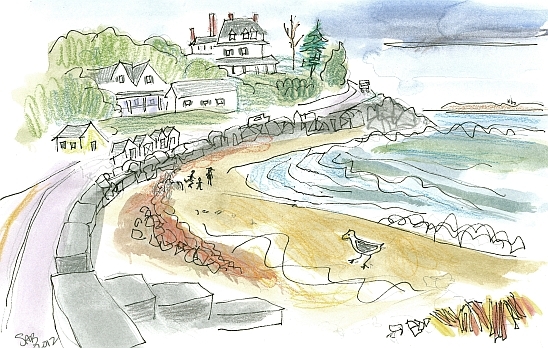 The houses on the hill are part of Boar’s Head Historic District, and the path in front of those little fishing huts (now vacation rental properties) along the rocks is called King’s Way. I wonder if the name is in jest, or was it a significant pathway during Colonial times? I have always been interested in scale. Since I was a child. But I may have pushed it too far here. Does the sea gull look gigantic? Compared to the people farther down the beach? The Isles of Shoals are in the distance. We’re now in Hampton, NH, the next town to the south. We never seem to get to the annual Hampton Beach Sand Sculpture competition at the correct time. Usually we get there too early, when all there is to see are heaps of sand, awaiting the sculptors’ touches. This year, we got there late when weeds were sprouting out of the sand sculptures. At least this one was still standing. The model for this piece is the bandstand at the beach. And the model for the bandstand seems to be a barn with two silos. I enjoyed including the tiny people and their furniture on the beach. 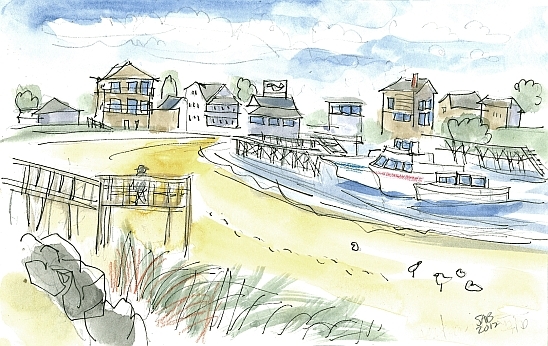 Seabrook, NH is the last and most southern of the five towns that make up the NH seacoast. All 16 miles of it. Massachusetts lies just south of Seabrook. We had to be careful about the state line when planning this drawing. Tour boats for whale watches, deep sea fishing, and maybe trips out to the Isles of Shoals line the shore. I have plans for next summer to see a whale, and also the Isles of Shoals. I went deep sea fishing with my family as a child. Once was good, or actually just OK. Think unexpectedly rough seas. This beach faces inland and is protected from the open ocean. I had never been to the James Edgerly park in Farmington, NH. Initially I was attracted to this cast iron gate. It says “buckeye” and “patent” on it, and other words I couldn’t read. 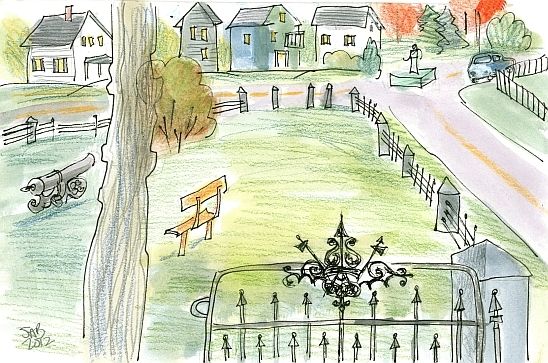 So my plan was to draw the gate; then that expanded to all the fencing. Then the bench, the tree and the cannon. Then the road and the houses and the green water pump in the middle of the intersection. Lastly, I drew the little blue car where my husband was waiting for me. New Hampshire is not a densely populated place. Usually when I draw, during the week, most people are at work or school. I include the residents of New Hampshire when I can. Another town, another cannon. This one is in the Veterans’ Park in Salem, NH. It was after dark, and I drew by the yellow aura of a streetlight. The white wooden-clad building is the Salem Historical Museum in the former town hall. There are two millstones embedded in the lawn as decoration. Salem is also known for an old amusement park called Canobie Lake, an unexplained series of rock structures dubbed America’s Stonehenge, and a race track. A gravitational pull leads me to the oldest parts of towns first. Next time through Salem, I will be drawn to the other attractions. Milton, NH is next to the Maine border. The town is rather spread out, and we drove around a bit while I mulled over the options for a drawing. When we first arrived in this part, Milton Mills, lots of people were coming out of this red Victorian structure. It is the Milton Free Library, originally built as a school. And then we drove around some more. When we returned to this building, most of the people had left, except for some teens chatting and using the children’s swings. I decided to include the swings, but not the teens. The seats are made of rubber and really uncomfortable, unless you are a child. 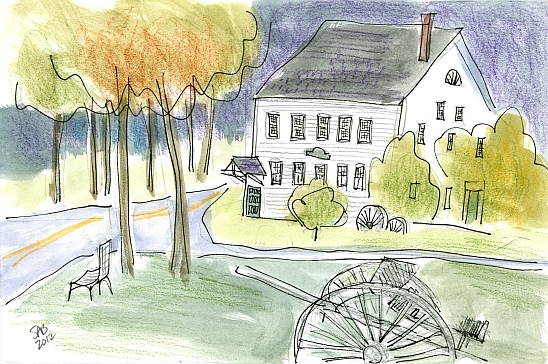 This town once had mills that manufactured woolen blankets, shoes, carriages, and lumber. And fiber lunch boxes. This was a form of reinforced cardboard. Perhaps they still surface at antique shows. Wakefield was another spread out town. I chose this scene for clear reasons...the colors. Of course Fall in New England is my favorite season because of the vivid colors of the autumn leaves. Add that to the unusually bright paint colors here in this part of town. We came into this town by the road to the right of the pink and purple house. We both gasped. 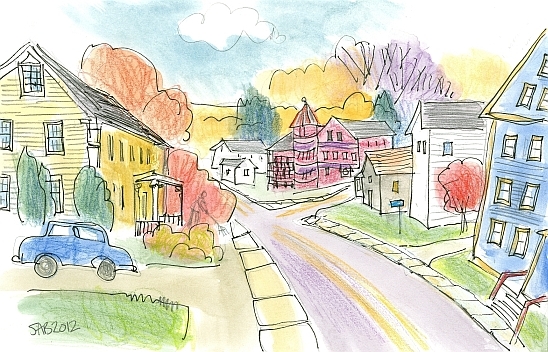 Most places in NH do not have any restrictions on house color choices. But most places are subdued and reasonably harmonious with white houses and green or black shutters. Here in Wakefield, there is no need to go to a tropical isle, or Miami, to take in bright colors. This corner must look cheery during the snowy, long, winter months. What color is my house? Brown. It was that color when we bought it. Our colors are out of the windows on the trees, ridge and sky. Apple orchards abound in Hampton Falls, NH, and so we drove to one, called Applecrest. And we decided to walk out into the orchards to pick our own apples. This is big business in the autumn: family outings to orchards. The parking lot there was enormous. The old tree squats close to the ground. Some apples have dropped onto the soft grass, and have been nibbled by animals. Or children. 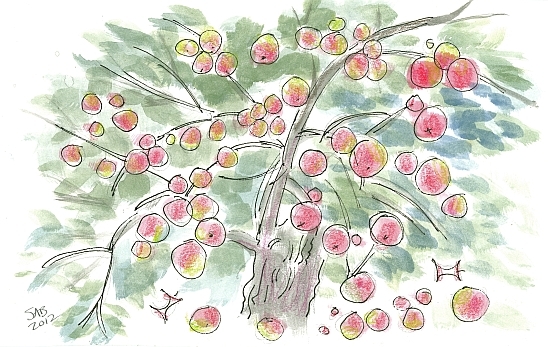 The apples grow in clusters like berries. We are still eating our bag’s worth that we picked from this tree. This impressive wooden building erected in the 1890s is the town hall in New Durham, NH. The town was settled by people from Durham, not that far to the south. 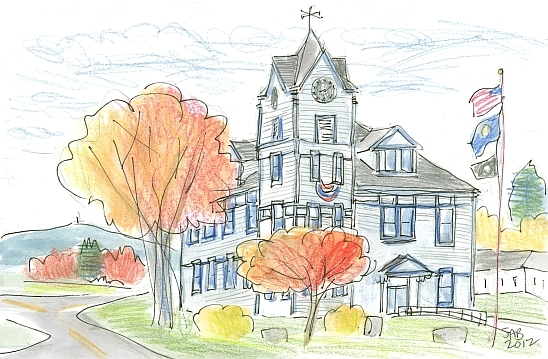 Town halls in New England serve as meeting spaces, voting places, and offices for the town’s administrative system. The scale of buildings built during this late Victorian time frame is frankly out of scale with anything built before or since. It must have been quite an age to live in. It shows a complete confidence in the future. However, a bank bust and recession followed this era. Plus ça change, plus c’est la même chose. 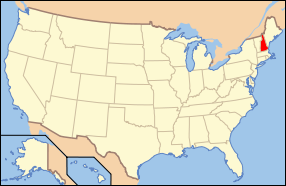 Brookfield, NH, with a population of 712 in 2010 census, has an area of 23.3 square miles (60 sq km). Within the woodlands of this small town run 136 miles of stone walls. The walls line the former agricultural fields of the 19th century. With a precipitous decline in numbers of residents after the mid 1800s, few farmers remained to keep the land cleared, and the trees happily regrew. We parked in the parking lot of the Brookfield town house (or town hall), built 1915 or thereabouts. As I looked to my right, I loved the view. No need to pace around this time. I didn’t even leave the car. 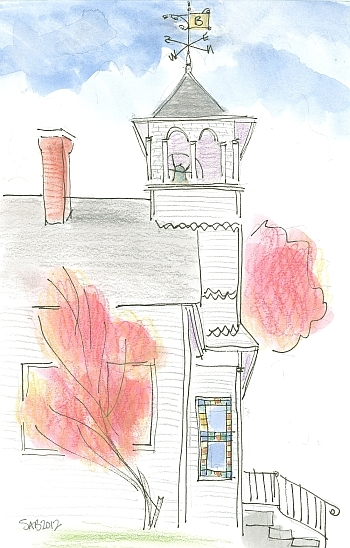 I paid very close attention to the leaded glass window, the wrought iron railing, and the two gloriously colored trees. The lovely weather vane with the letter B cut out of the metal was a fine topper for the bell tower. Please tell me that I am not the last person to look up as I walk around. And not down at a tiny little screen with the latest text from my bestest friend. My BFF. As a friend of mine says, “You always have a story”. Yes, indeed. 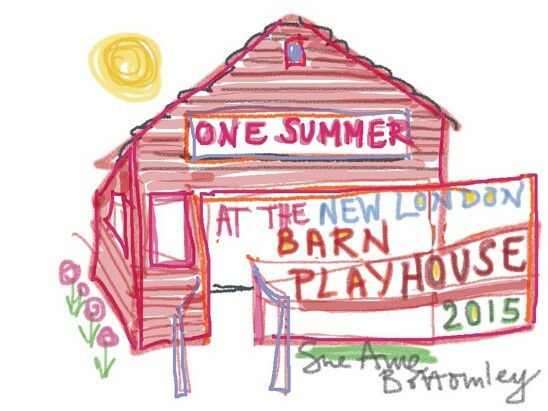 The story here of Sandown, NH is unusual in my experiences drawing around the state for the last two years. 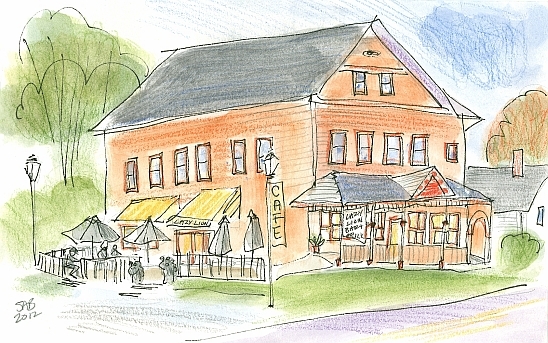 I had planned on drawing the exterior of the fine old edifice, the Sandown Meeting House, built 1774. When we parked around to the side, two things came to my attention: three people seemed to be involved in making a video of the front of the building, and the side door was open. 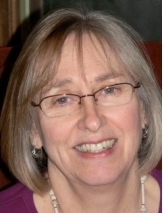 After rubbing my hand over the age-scarred door, I pushed on the iron latch. What I saw took my breath away. Large clear glass windows flooded the space with day light. All around me were the old closed pews, each once owned by a family of the town. And a raised pulpit, eleven feet above the floor. The columns on the sides of the pulpit and folding half table below it are of faux-finish marble. Fascinating. 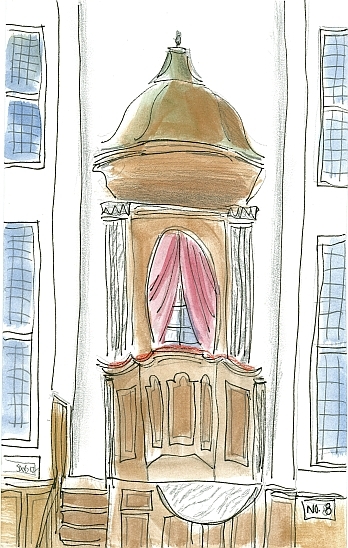 I ran up the stairs to the left of the pulpit...and once up there, leaned on the red velvet arm rest, imagining myself speaking to the people below. The sounding board above my head would have amplified my voice. I didn’t try it. A very powerful place to be, for sure. The feeling of the presence of past events pervaded the air. Townspeople filled the pews. This meetinghouse is indeed well known as being in its original state, that is having no electricity, heating, or plumbing of any kind. The molding hasn't been painted a fashionable color. The pews haven't been modernized. It was used for over two centuries as a place of church services, but also for social meetings and voting, From what I read, it was busy seven days a week. The Constitution of the United States, 1787, was ratified here when New Hampshire’s vote put the count over the top. Ballots were filed here for presidents from George Washington to Herbert Hoover. The occasional social event still takes place here. I drew even faster than usual. Why? Because the three people making a video were also planning to spend time inside recording any paranormal events that might transpire. I read online that this is not the first time this has happened. Not a big believer in paranormal, I nonetheless felt some spirits here in the Sandown Meeting House. 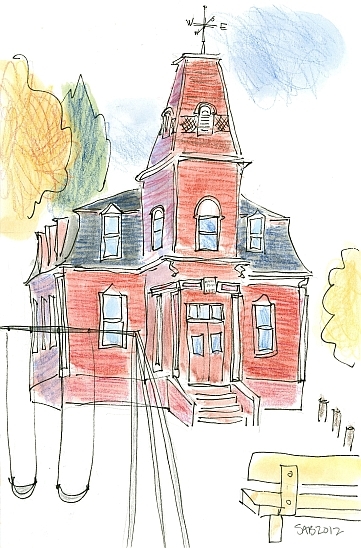 We rounded a corner in Deerfield, NH, and this orangey building popped into view. When I saw the words Lazy Lion Café, I took heart. We could have a bite to eat, and I wouldn’t have to draw on an empty stomach. After a satisfying bowl of chili and some delicious bread, I walked across the street to put pencil to paper. This is the former G. L. Wentworth store, another general store for my collection.. Many people know this town for its long standing and popular agricultural and family fun Deerfield Fair. 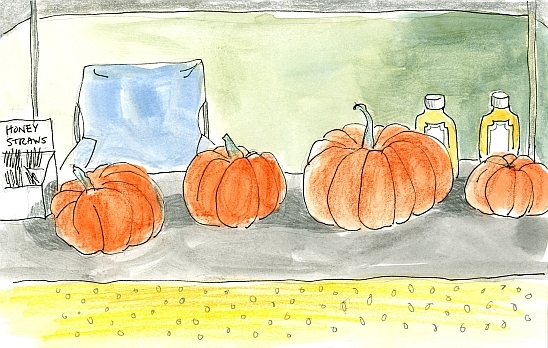 To round out the harvest season, I include this drawing of pumpkins from the Cutting Farm in Springfield, NH. The owners, the Cutting family, were vendors next to us at the Market on the Green this past summer. There were few customers there that last day, so I took the opportunity to draw my neighbors’ produce. They also keep bees and sell wonderful honey in the bottles you see on the right. Honey straws at the left were favorites of the children. They would come running up with their dollar bills in their hands to buy a few. And a special note to my New England readers – I intend to cap off my DRAW-NH project on Saturday November 17th in Rollinsford, along the Maine border about 10 miles north of Portsmouth. And contrary to my normal mode of operation, I have a pretty good idea what I’m going to draw there. 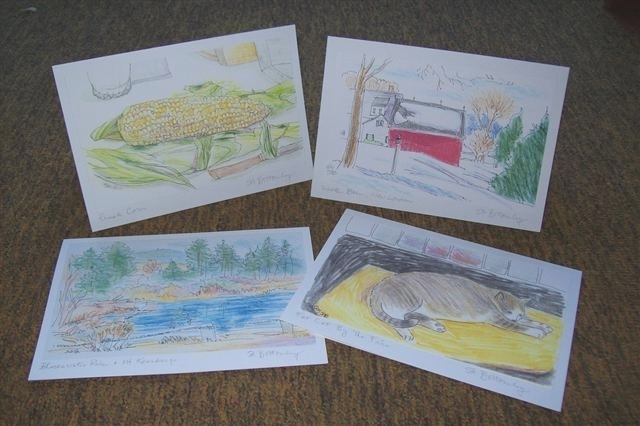 Rollinsford’s 1848 Salmon Falls Mills have been transformed into artists’ studios and other new uses, and the artists there are having Open Studios that weekend. 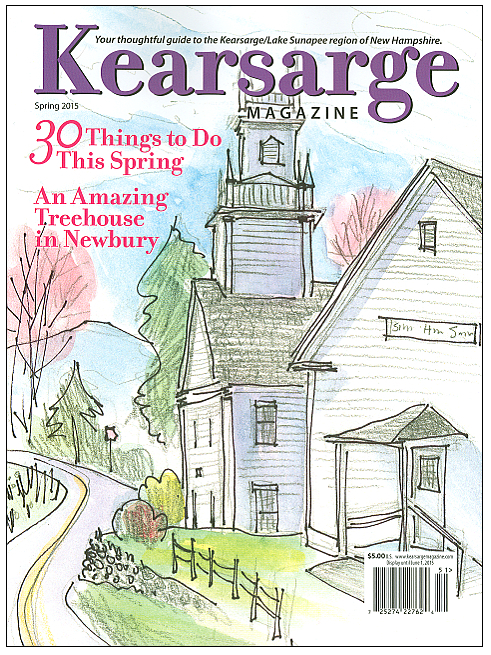 While I’m not associated with that establishment, it does seem a fitting place and occasion for the culmination of my project—drawing all 234 towns in New Hampshire by the end of this year. And if you’ve followed my blog postings for a while, you’ll know that repurposed mill buildings are among my favorite subjects to draw. I plan to be there at about noon, and I’d be happy to meet any of my readers who might be in the neighborhood at that time, or might feel like taking a drive. There’s a coffee shop in the mill, so you can probably find me somewhere around there. Here’s a link to the mill’s location at Google Maps. If you expect to join me there and are interested in procuring notecards or other type prints of your home town (or any other images that have appeared on my blog), check out the Notecard Sidebar here at the blog and get in touch with me. I’ll print them up for you and have them with me.